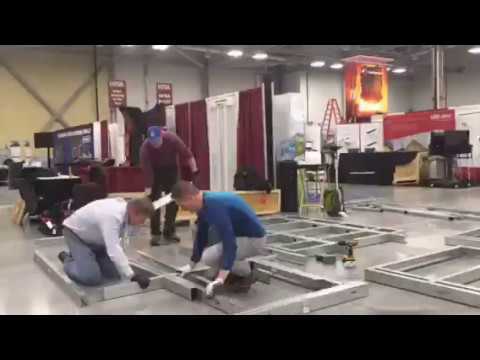 At the recent National Frame Builders’ Association trade show, we decided to put our SmartBuild System to the test. We have touted that this light gauge steel technology which includes powerful, simple software and a manufactured product solution so easy to use that little to no training is required. So we took a software company CEO, COO and Product Manager and asked them to assemble a mini 10’X10’ pole barn made with SmartBuild light gauge steel. The pieces were ink jet marked with matching letter and number and used male/female dimples with pilot holes for walls and notched chords and alignment holes for truss pieces. The idea is that there is no measuring, marking, or cutting of pieces and no jigging required to assemble walls and trusses. As you can see from this time lapse video, our amateur crew was able to put it together in record time with no broken bones or cuts – and very little skill required!